The Jewish Danielsson, whose mother survived Auschwitz, struck the skinhead during a march in the Swedish town of Växjö, 1985. 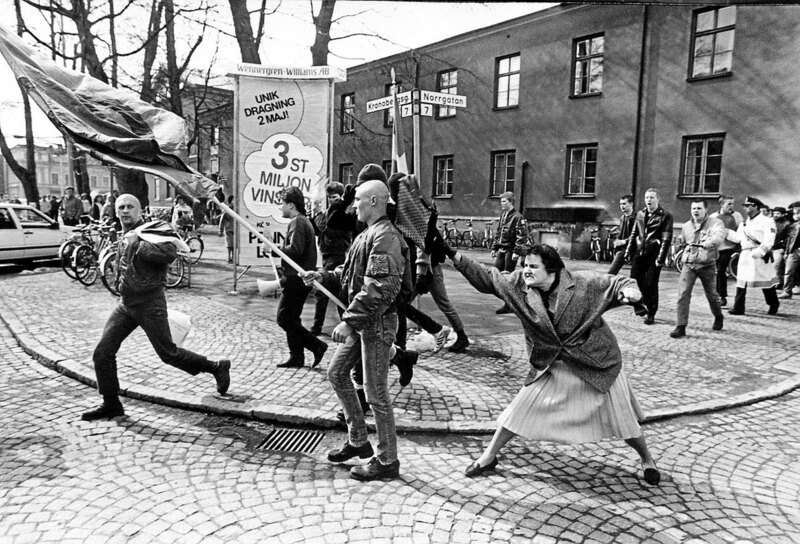 A woman Hitting a neo-Nazi with her handbag is a famous photograph taken in Växjö, Sweden on 13 April 1985 by Hans Runesson. It depicts a 38-year-old woman hitting a marching Nazi-skinhead with a handbag. The photograph was taken during a demonstration of the Nordic Reich Party supporters. The angle of the photo, her posture, facial expression, and what she’s wearing makes her look a lot older than she really is. The picturet was published in the next day’s Dagens Nyheter and a day later in some British newspapers. It sparked a huge discussion in Sweden, and the woman – who suffered from anxiety and hated the sudden media spotlight – ended up committing suicide two years later. The woman in the photograph is Danuta Danielsson. She was of Polish-Jewish origin, her mother had been in a concentration camp and she got very angry when she saw the young Nazis in her quiet town. When the incident happened she had only lived in Sweden for a few years. Dunata met her future Swedish husband at a jazz festival in Poland and shortly after that they were married. Her acquaintances described her as energetic and positive during their first years in the new country. But she had a darker side, sometimes she was mentally fragile. Very often she screamed menacingly to people on the streets, sometimes she muttered to herself. She was also treated at a psych ward and eventually threw herself from a water tower in 1988. The neo-Nazi’s name was Seppo Seluska who was a militant Nazi from the Nordic Reich Party, later convicted for murder. He tortured and murdered a Jewish homosexual later the same year. In 2014 the Swedish sculptor Susanna Arwin made a miniature statue of Danielsson based on the photograph. There was an initiative to erect a life-size bronze version on Arwin’s statue in the city of Växjö, but the project was blocked by local politicians of the Centre Party believing that such a statue might promote violence. Also, the artist who was going to make the statue hadn’t asked the original photographer for permission. The photographer opposes the statue since he thinks the context of the image is too important to be removed. Runesson’s photograph was selected as the Swedish Picture of the Year (Årets bild) 1985 and later as the Picture of the Century by the magazine Vi and the Photographic Historical Society of Sweden. not everyone who is 38 is slim and beautiful.. Considering she was in a concentration camp with her parents, it's amazing she's even alive. Please excuse this poor human being from not looking her age. Compassion and empathy are more than words. Maybe not in your part of the world, but that isn't true elsewhere. Hyj. You have just read an article about a women who was mentally ill which was no doubt exacerbated by the experiences of her loved ones who took an individual stand against hatred, although she was not to know it the man she attacked was so filled with hate he could torture someone and when she couldn't deal with the aftermath ended up taking her own life and all you can think to comment is about her age?? Really insightful comments you two!